STRONGARM M30 reliably defends High Security sites world-wide. This high duty cycle crash certified ASTM F2656-07 M30, P1 barrier arm provides incomparable security and safety using proven controls and hydraulics perfected over decades in the most challenging conditions. STRONGARM M50 reliably defends High Security sites world-wide. This high duty cycle crash certified ASTM F2656-07 M50, P2 barrier arm provides incomparable security and safety using proven controls and hydraulics perfected over decades in the most challenging conditions. Unique dual arm design prevents a large truck or a small passenger vehicle from breaching the security perimeter. Hy-Security StrongArmPark DC 10 is an extemely reliable, continuous duty, electromechanical, UPS battery-up parking barrier arm operator designed for millions of maintenance-free cycles in access and revenue control applications. Every StrongArmPark DC operator includes an advanced HyProtect breakaway arm mount, which reduckes the cost of arm replacement due to a vehicle strike. Safety features include resileint bumper along base and Dynamic Reversing Sensor feature, to reduce possibility of injury or vehicle damage. Slower operating, counter balanced arm. For traffic control and parking applications, available in 1/2 horsepower, 115V or 230V supply voltage, various arm lengths. 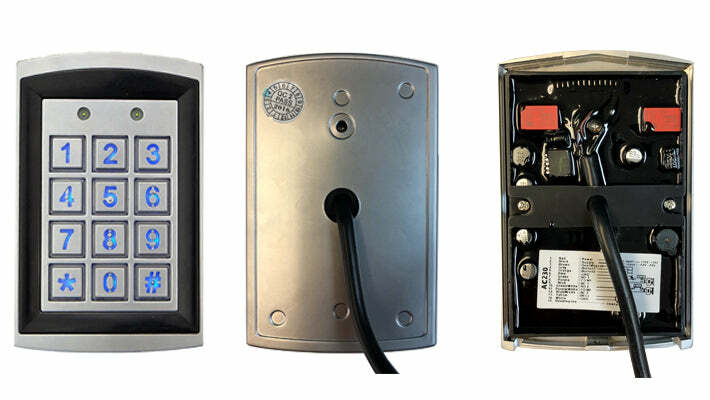 The BGUS-D has four programmable options for gate operation in case of an AC power failure.